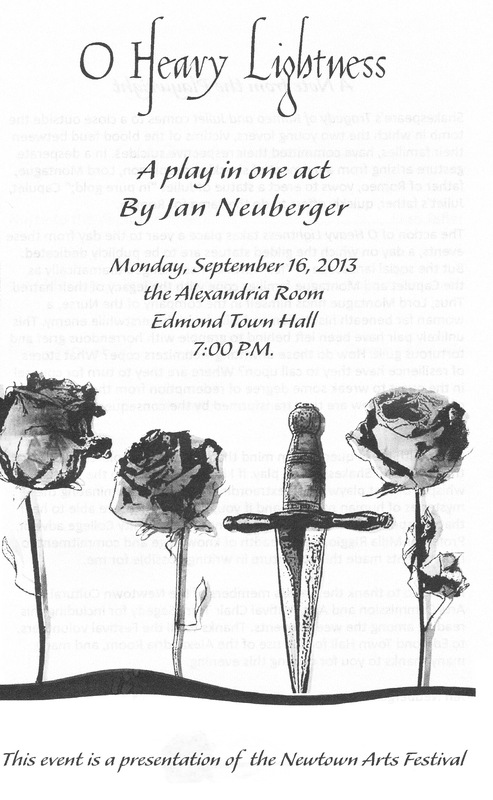 I recently attended the reading of a new play by Jan Neuberger at the Newtown Arts Festival. The three-character cast sat/stood on stage with music stands to hold their scripts. The play was great, but I was more impressed with the actor and actresses who “read” their parts. To me, it seemed as if they had memorized their scripts and just had the paper in front of them in case they forgot a line or two. Nope, wrong. Even though the performers turned back and forth to face one another (without their scripts) and used hand gestures and expressions on stage to act out their performance, they were still reading. I spoke with the actress Jean Tafler, who played the lead role brilliantly, after the show and asked her about it. She confirmed that she had in fact been reading. “You should see me when I’ve memorized my lines,” she said with a wink. I wouldn’t know how to critique an acting performance, but I would give her reading performance five stars. Every writer needs to learn how to read aloud to promote his/her book. I participated in a few “open mic” sessions with the California Writer’s Club before I moved back to Connecticut. I always thought that I had done pretty well, as I had received numerous compliments after each reading. Other writers struggled to project their voice, use emotion in their speech, or even just follow their own lines. I may have done okay, but all of us had room for improvement with our reading. After seeing Ms. Tafler’s reading performance, I could tell that actors have had to develop reading skills on the way to acting on stage. Writers who need to boost their public reading performances should seek out a local play reading to observe the actors who perform so naturally. For me, it O Heavy Lightness was truly a master class in reading. For those of you interested in the play, here’s a snippet from the website…. A play in one act by Newtown resident Jan Neuberger, O Heavy Lightness imagines the aftermath of the deaths of Shakespeare’s Romeo and Juliet as experienced by two of that iconic tragedy’s secondary characters. Set one year to the day from the senseless suicides of the star-crossed young lovers, the action pivots on the unlikely coming together of Juliet’s beloved Nurse and Lord Montague, Romeo’s father. Widely separated by class distinction and clan alliance, the two discover common ground in the process of mourning—and even laughing—together. While the plot is entirely original, the play’s language echoes closely the Elizabethan idiom in which Shakespeare and his contemporaries spoke and wrote. I have attended a few of these reading plays. At first I was a little put off but now find I enjoy them very much. Not sure how I would do reading any of my work in front of a audience. I had the same worries! Just by chance, a friend stopped by my apartment before I went to my first reading. I rehearsed in front of her about five times and it REALLY helped. Grab a friend and practice!